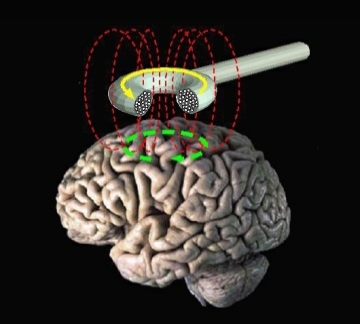 Figure 1: This is the mechanism by which transcranial magnetic stimulations are tested in these patients. The human brain affects almost everything aspect of existence, from locomotion and speech to feeling. Decision making and self-control are also affected by parts of the brain, specifically the prefrontal cortex. However, a recent study led by Alexander Soutscheck in the Laboratory for Social and Neural Systems Research of the University of Zurich has shown that there could also be another mechanism for decision making and self-control that involves the posterior temporal parietal junction (pTPJ). The experiment was carried out on 43 volunteers recruited from the University of Zurich. The procedure involved manipulating the pTPJ of test subjects using transcranial magnetic stimulation (TMS) and observing how it affected their decision making. TMS utilizes magnetic impulses to directly stimulate certain regions of the brain in a noninvasive manner. These subjects were then given two different tasks: an intertemporal task (deciding between a small immediate or large delayed reward) and an interpersonal task (deciding between a selfish reward or a pro-social reward). After performing an ANOVA test to determine whether the differences in values between groups are considered to be statistically significant, it was discovered that there was in fact a significant difference in the decisions made by subjects who were under TMS, as opposed to those who were not. Subjects that had experienced TMS to their pTPJ were more likely to choose the small immediate and selfish rewards over the large delayed and pro-social rewards. This supports the theory that the pTPJ is involved in promoting delayed gratification and pro-social behavior. As of now, the actual mechanism by which the pTPJ affects decision making is still being researched. Further studies are needed to determine how the pTPJ works in tandem with the prefrontal cortex to make decisions. Such research could improve brain mapping and improve out understanding of human choice. A. Soutscheck, et al., Brain stimulation reveals crucial role of overcoming self-centeredness in self-control. Science Advances (2016).